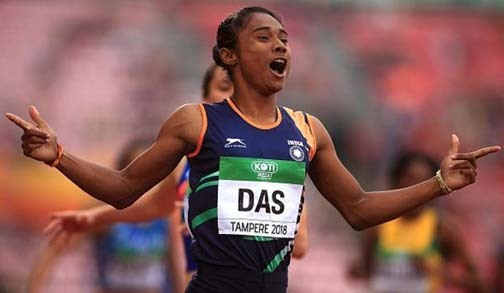 Assam’s sprint queen Hima Das, was recently featured in the Forbes India, ’30 under 30’ list. It marks Forbes India’s sixth edition of the prestigious ranking. This list which Forbes issues annually recognizes people under 30 from different fields, who have done exceptional work. Hima became the first Indian to win a gold at an international track event IAAF World U20 Athletics Championships, held in Tampere, Finland, in July 2018. She also won a silver at the Asian Games in Jakarta, Indonesia, with a record 50.79-seconds finish in 400 metres. She followed that with a gold at the women’s 4×400 metres relay and a silver. She also received the Arjuna Award, India’s second highest sporting honour. The 19-year-old then became the country’s first youth ambassador for the United Nations Children’s Fund (UNICEF) India recently. Despite her achievements, Hima refuses to sit on her laurels. She is constantly striving to better her timing. With the Olympics scheduled for 2020, she could very well make the headlines again. Hima whose parents are farmers hails from Dhing village in Assam.